A book Wingate Elementary School student Michaela Turner wrote this year for the Centre County Library Young Author and Illustrator Contest not only placed first in the fourth-grade category of the competition, but was also given special treatment by the Titanic Museum in Pigeon Forge, Tennessee. Michaela, a soon-to-be fifth-grader, wrote the original book, “From Unsinkable to Sinkable: Margaret’s Story,” about a girl aboard the cruise liner, the Titanic, that sunk after hitting an iceberg in the north Atlantic Ocean on April 15, 1912 on its maiden voyage from Southampton, England to New York City. Michaela’s mother, Nicole Turner, said she reached out to the museum via social media after her daughter took home top prize at the county library’s writing competition and also let them know of the family’s plans to visit the museum. She sent them the first chapter of the book, and museum representatives reportedly requested to see more. “I was told that they had a surprise in mind for Michaela, so I sent it,” she said. Michaela’s inspiration for writing about the titanic came in third grade when she read her first book about the Titanic, and has since studied about the ship and other things related to it. 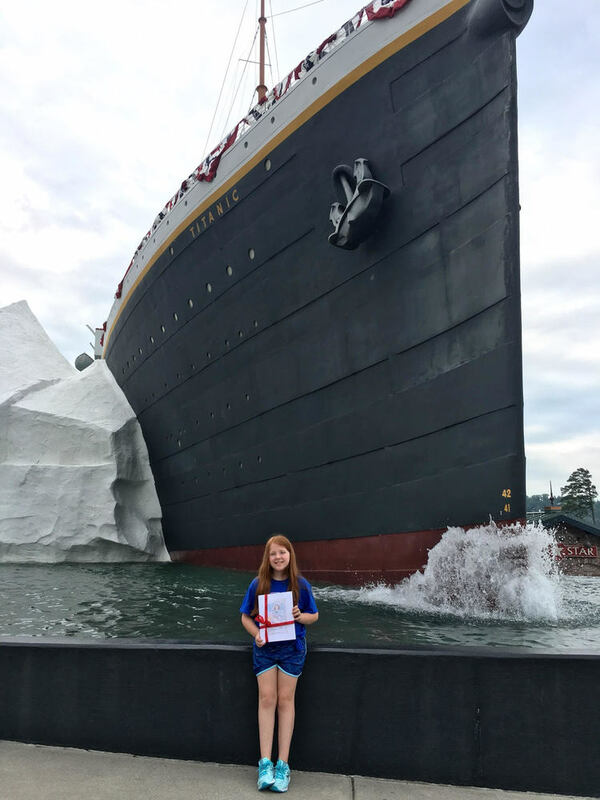 Earlier this summer, Michaela and her family traveled to Tennessee to visit the Titanic Museum where they got the chance to see and learn about the ship. It included relics such as a pocket watch recovered by a passenger – the hands of the watch still frozen in time just before the Titanic sank. They also got to see dresses designed by passenger Lady Duff-Gordon, a life jacket, tools, silverware and more. As for the surprise the museum had in mind for Michaela? Members of the museum presented her with 10 paperback copies of her book wrapped in Titanic logo ribbons, and edited with new font and anchors placed along the margin.